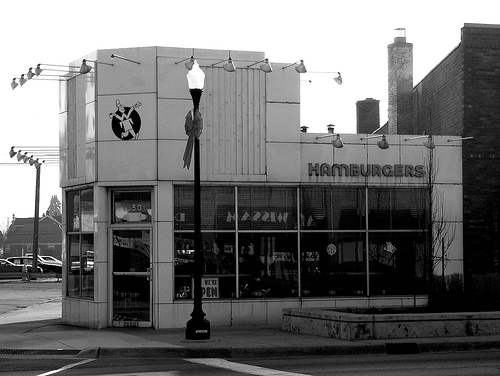 SECOND POST – March 12, 2012 – MERCURY NEWS SERVICE CULTURAL PAGE announces proudly the winner of the FOURTH BEST DETROIT AREA RESTAURANT: IT’S CALLED “HAMBURGERS”. By, Flauntay Skullpepper, special to MNS. Located centrally and strategically at Michigan Avenue and Calhoun (or something like that), this eatery has been around since Marshall Tito. It’s also owned by “Walt”, a Serb from Belgrade. No, this is not a Telway Slider emporium. If you remember, the Telway was elected second best restaurant in the State of Michigan by a whole lot of people in a blind statistical study. Yes, it’s true, the architectural style suggests a similar origin. 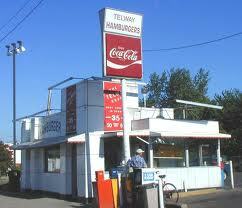 But, Telway is located in “barbarous Detroit”, while “Hamburgers” is found on Dearborn’s refined Michigan Avenue west of Wyoming. Owned and operated by “Walt” and his wife, this is one helluva hamburger joint. First of all, Walt is old fashioned as you can tell immediately by his charming Eastern European demeanor and Dracula-like accent. He is a Serb, born and bred in Belgrade, during the Golden Age of Josip Broz or Marshall Tito. Walt makes soups by hand in his kitchen which gives the fare an authentic taste. His ham is sliced from a porcine thigh that stands proudly before the clientele to announce its genuineness and commitment to their satisfaction. No processed garbage here, folks: when you order split pea soup with ham, you watch Walt slice it for you and ladle in the tasty, thick shavings. His chicken soup is so homemade, you almost imagine the deft, plump fingers which fashioned the dumplings, like spatzel, then, lovingly plopped them in the kettle to absorb the chicken broth, itself flavored with julienne of carrots and celery. What a masterpiece! The Telway has nothing similar to the soups at “Hamburgers”. Telway offers a shady “Hillbilly Chile” which was criticised before in our pages as a “cross between Laredo Gravy Train and Texan Alpo Ground Chunky Hash”; while this establishment engages the palate with a mind-numbing variety of spectral flavours all cascading down from the mind of Walt, the head chef and creator of the vast menu which, conveniently, is found printed on the wall in red letters. No effete menus here or pretentiousness. “The Wall tells it All”. One of the hallmarks of “Hamburgers” is its honesty. This restaurant has no hot dogs! You can ask for them, but Walt will always tell his customers in that slavic drawl: “Nooo, vee hef no dogs.” This critic believes strongly that the absence of coney dogs or the like – monstrous mutations from the Brooklyn “sauerkraut/onion” (Nathan’s, Yuck!) abominations to Chicago’s “dump the laundry” concoctions, even to Detroit’s signature “suet-pile old cow chile” – enhances the dining experience at “Hamburgers”. So many restaurants present what customers have come to take for granted: I mean, shouldn’t this place have coney dogs? Walt rejoinders with a stentorian: “NO! !” And by the by, Walt proudly denies his customers chile con carne.